This semester, I choose to live in Greenspace, a special interest floor in Burton, both because of my passion for sustainability and proximity to class (plus the dining hall). At our first meeting, which took place earlier this week, I received a zero waste kit that contained a few essential items for a sustainable living. Let’s unpack and see how they can help reduce environmental footprint. Reusable produce bag: If you are into cooking and meal prep, chances are that you visit the grocery store at least once a week. The norm is to use thin plastic bags to wrap small produce like tomatoes or lemons before placing them in the shopping cart. This small reusable bag constitutes the perfect alternative to traditional single-use produce bags. Bee’s Wrap ®️: Still in the food world, plastic films are often used to wrap cheese or half-eaten fruits, or cover bowls to delay spoiling. The company Bee’s Wrap ®️ provides a better way to save leftovers by specializing in this eco-friendly wrap “made with organic cotton, beeswax, organic jojoba oil, and tree resin”. Silk dental floss: I’ve never thought of dental floss as an environmental threat until I had my hands on this 100% silk floss in a refillable container. The product’s package, from Dental Lace ®️, reads that “if everyone in the U.S. flosses their teeth according to ADA recommendations, every year our empty containers alone would fill a landfill the size of a football field that’s 6 stories high”. Despite the theoretical nature of this astonishing fact, it’s always better to use a product made out of natural protein fiber rather than non-biodegradable plastic. Reusable hand towel: Forget paper towel rolls. Save your money. Save some trees. Glass bottle: Nothing more than an empty cold tea container, this glass bottle is included in the kit as a prelude to a DIY essentials (dish soap, detergent) event tonight (Friday, September 7th, 2018) from 8 to 9pm in Burton 1 lounge. You are invited to participate to learn new skills and repurpose your old containers! Reusable mug reward card: Brought to you by Dining Team Green, this card is a new way to promote reusable containers on campus. Every time you purchase coffee with a reusable mug at Starbucks, Connections or Peet’s, your card will be punched; after ten punches, you receive a free pastry! Stickers: What would be a giveaway without stickers? Two stickers (Greenspace and UR Sustainable) were also included in the kit as a cherry on the top of the cake. 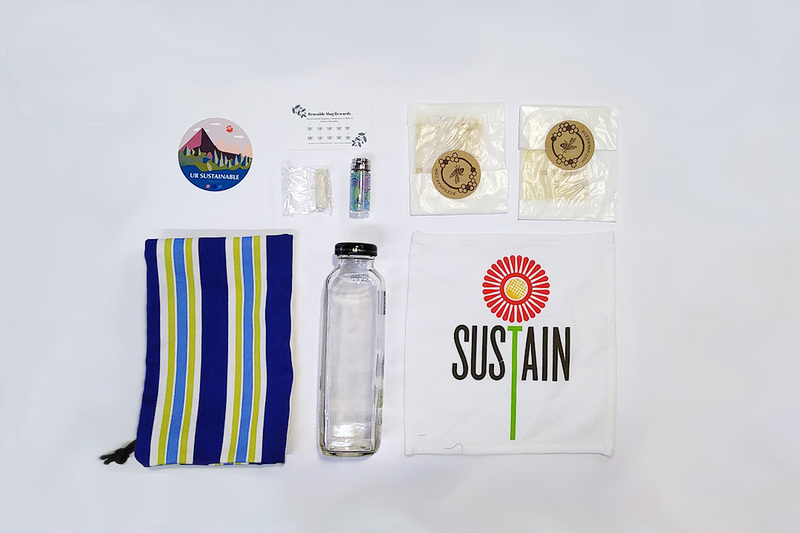 Shout out to our E-board, especially Kayla Zilke, for equipping Greenspace members with this zero waste kit!